It’s the tail end of summer and the beginning of fall. Stone fruit (peaches, plums, nectarines) are ripe and delicious and I’m totally obsessed with them right now. From fresh slices, to grilled, to relishes and salsas, to juice and sweet desserts, these gems are so versatile in cooking and baking. 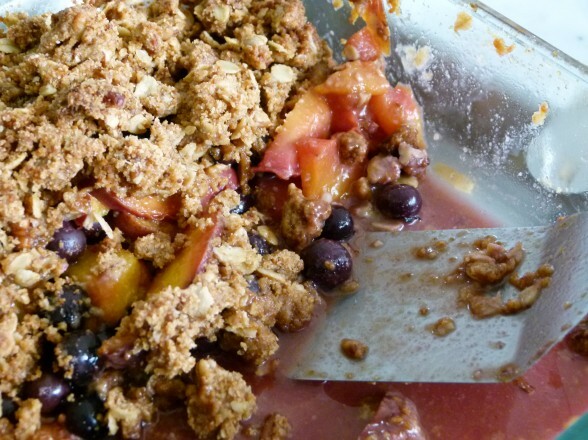 Here’s a simple, very tasty dessert that features peaches and blueberries. I hope you’ll try and enjoy! Preheat oven to 375 degrees. Toss together peach slices, brown sugar, flour and ginger. Add blueberries and 1/8 cup water; toss to combine. 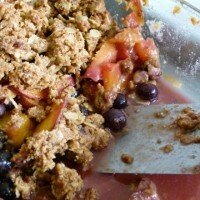 Spoon fruit mixture into 2-quart square baking dish. Bake, uncovered, 20 minutes. Meanwhile, combine cookies, oats and if desired, pecans. Stir in butter. Sprinkle over partially baked fruit. Bake another 15 to 20 minutes or until fruit is bubbly and topping is lightly browned. Cool on a wire rack for 30 minutes. Serve warm.